Liverpool vs FC Porto, Champions League Quarter-Final Live Streaming Online: How to Get UEFA CL 2018–19 Leg 1 Match Live Telecast on TV & Free Football Score Updates in Indian Time? Liverpool fans were delighted with the draw of the UEFA Champions League as it put them against probably the weakest team left in Europe’s premier competition – FC Porto. With the race for the English Premier League title race so close, Liverpool know a two-legged contest with Porto may not drain them much as compared to some of the elite clubs. But in football, nothing is guaranteed, and Jurgen Klopp and his men still need to get the job done. The advantage for Porto is that it does not have to play the second leg away which means they can target away goals in Anfield tonight. If you are looking for the live telecast and online streaming of the Liverpool vs FC Porto, Champions League Quarter-Final Leg 1 match, then you can find the relevant information here. Liverpool vs FC Porto - Live Football Score, Match 205. Jordan Henderson had a brilliant game coming on as a substitute against Southampton in the league and the Liverpool skipper should start against Porto. Partnering him will be Fabinho and Georginio Wijnaldum who would join the attack with every opportunity available. Mo Salah was on the scoresheet against Saints which was a huge sigh of relief for the Reds fans as the Egyptian was struggling for form. Sadio Mane and Virgil Van Dijk remain the two key players for Liverpool who are likely to have the most impact on the tie. The suspension of Pepe and Hector Herrera is a huge blow for Fc Porto as both are integral to the Portuguese outfit’s defensive structure. Alex Telles will undergo a late fitness test in order to make the starting eleven after missing the weekend’s league game. Moussa Marega has bagged six goals so far in the Champions League, and along with strike partner Tiquinho Soares, they are capable of being on the scoresheet. 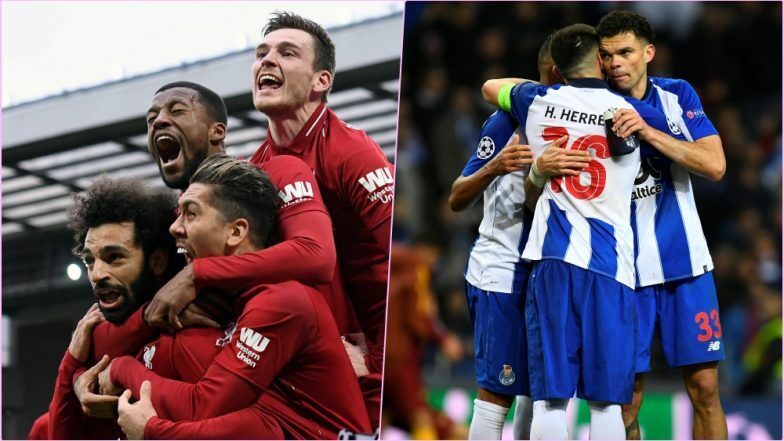 When is Liverpool vs FC Porto, Champions League 2018-19 Quarter-Final Leg 1 Football Match Schedule (Date, Time and Venue Details)? It is going to be another exciting late-night match for football fans in India as Liverpool and FC Porto face-off in UEFA Champions League quarter-final Leg 1 of 2 on April 9, 2019, at 12:30 am IST (Wednesday midnight). Liverpool vs FC Porto football match will be held at Anfield in Liverpool, England. How to Watch Live Telecast of Liverpool vs FC Porto, Champions League 2018-19 Quarter-Final Leg 1 Football Match? The round of eight contest between Liverpool and FC Porto, makes an exciting contest in UEFA Champions League. The live telecast of Liverpool vs FC Porto will be done on Sony Ten 1, Sony Ten 2, or Sony ESPN channels. Where to Get Free Live Streaming Online of Liverpool vs FC Porto, Champions League 2018-19 Quarter-Final Leg 1 Football Match? With Sony Sports Network as the official broadcaster, their digital platform Sony Liv will be providing the free video streaming. You can catch Liverpool vs FC Porto, tie of UEFA Champions League with free live streaming online on Sony Liv. Live score updates of Liverpool vs FC Porto, will be available on LatestLY here. FC Porto will get the away goal, but Liverpool should win the game as they just have too much quality going forward. Iker Casillas can expect a busy game between the sticks for his club and his experience will come in handy.